Registration will close at midnight on 4 September, CST. There are no pre-registration requirements for this class. You can register EVEN if you have not taken the BCQC or any other ICQC modules. 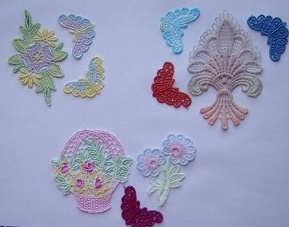 This Course covers: --Painting Fabric Backgrounds -- Painting and Dying Lace Motifs -- Inking Lace and Charms To register please email this information: Name State/Country Email Address to me at: shaw.kathy@yahoo.com before midnight (CST) on 4 September. The class instruction is FREE. You will need supplies. Here is the supply list link. The list asks for Kona cotton in white...but any white cotton that is "good enough" for you...is fine for me. Kona is what I consider the best brand for white quilters cotton fabric. Class begins on 5 September Please do not post photos before then. Class photos posted in class should not be uploaded directly to Pinterest from the class blog...as this also uploads a link to the private class site. You can upload your photos from your computer to Pinterest if you like. Some class photos may be chosen to upload to my own Pinterest as advertisement of this course for future attendees...IF you do not wish to have your photos used for this purpose...please just let me know when you register. This is not a "promise" that I will be using photos...just letting you know that it is a possibility down the road. Once you register, I will send you a welcome email AND you will receive an invitation from Blogger to join the private Class Blog. Email me if you have any issues in signing on to the class after receiving these two instructional emails. NOTE: I will be away from my computer for most of 2 September, so will not begin sending out class blog invitations or Welcome emails...until 3 September at the earliest. I so enjoyed this class and learned so much! Boy, am I having fun now using my stash of hand dyed silks, embroidery threads and fabrics I created in my projects. Thank you for teaching me Kathy. Hope you have many students eager to learn.